This is the real-world education platform that I wish I’d had access to when I started my own wedding photography business years ago. get instant access to all courses, downloads, live events... everything! Who Can Benefit From Wedding School Membership? The Wedding School will help you learn quickly and thoroughly, allowing you to develop your craft during the early days of business, while still taking care of the needs and expectations of their your clients. Moreover, you will learn critical business skills necessary to run and market your business, and to generate ongoing sales. The Wedding School provides updated education and support to address the changes in technology, marketing, and generational desires frequent in today's wedding photography marketplace, helping you learn new-school techniques to stay competitive in a rapidly changing, digitally connected world. Have benefited from a real-world training program that cuts through the fluff and goes straight to the important information needed to quickly progress your wedding photography business. Have learned how to grow a stable and profitable wedding photography business by providing exceptional service, skill, and artistry to the couples they serve. Have access to a well-organized and comprehensive educational curriculum that is 100% dedicated to wedding photographers, located in a single place, making it easy to find exactly what you want when you want it. Have access to a continuously updated Learning Library, ensuring that you will can always stay on top of what is relevant TODAY and not what was relevant last year. Are part of a collective community dedicated to wedding photography as a profession, a service, and an art form, which will help raise the standard of what it means to be a professional wedding photographer. The Wedding Fundamentals course at the heart of The Wedding School includes dozens of individual video courses, 4 comprehensive PDF workbooks with over 300 pages of content, and weekly Q&A calls that brings together everything Susan Stripling has taught and learned about wedding photography in her career. A growing collection of deep dives into the most requested wedding photography topics taught by Susan Stripling and guest instructors. New courses added every week. 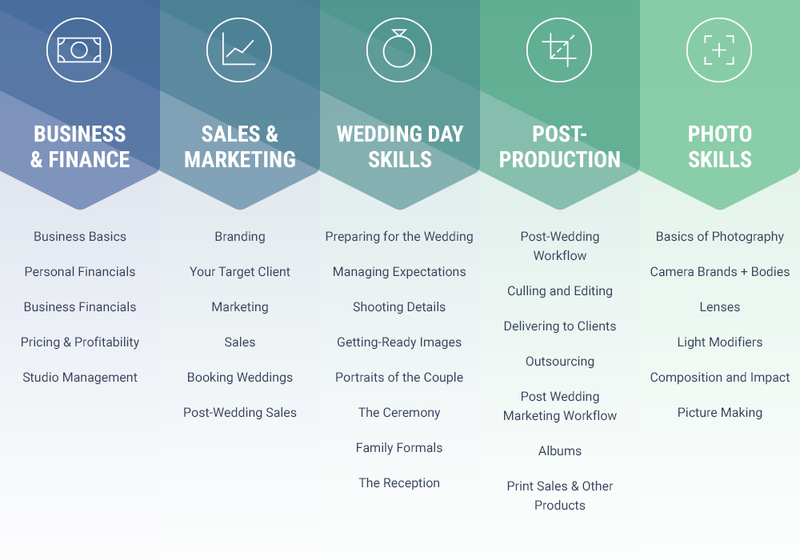 You’ll get access to all educational videos in the wedding fundamentals series covering all aspects of how to make a living as a profitable, working wedding photographer. Join a community of other photographers focused on growing their wedding business to discuss each week's lessons, share work, and build your professional network. 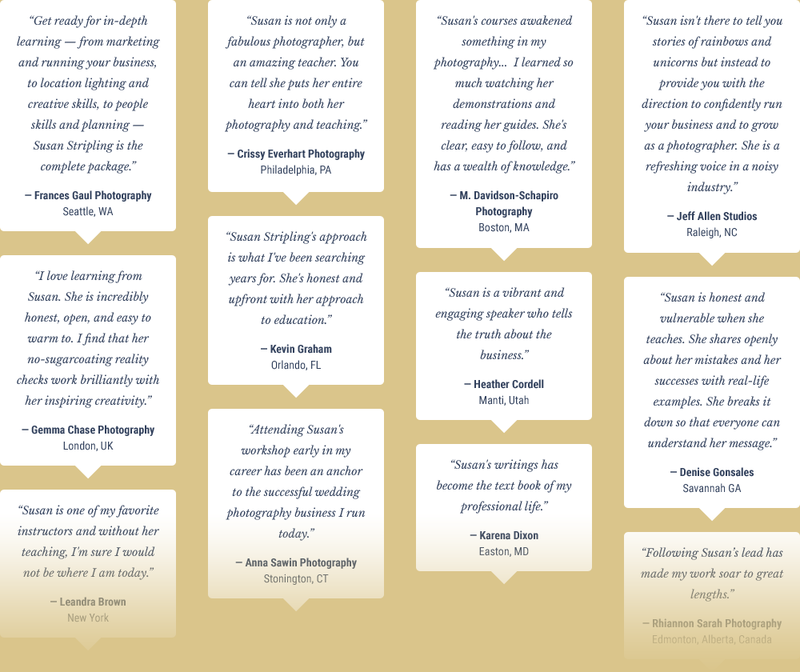 As part of your membership, you'll receive full access to a growing library of education from Susan and other renowned photographers. The library will be updated on a regular basis, with new releases and mini-classes. We believe that wedding photography is important. Our long-term mission is to provide the education, community, support, and clarity of purpose that raises the standards of what it means to be a professional wedding photographer today. We want The Wedding School to become the industry benchmark for the type of honest, real-world education that the wedding industry needs. Follow along with Susan's lessons in this massive resource guide, exclusive to members of The Wedding School. You'll get four in-depth, downloadable textbooks. You have questions, Susan has answers. Each week Susan will be recording special Q&A sessions to answer questions coming up in the Facebook group or in the individual course segments. No one teacher is an expert in all things, especially in an ever changing field like wedding photography. Get excited for surprise events! We’ll be doing special deep dives into photo techniques, lighting and more with several guest instructors. This is all part of the growing learning library. This is a new course, a new site, and there are a few surprises we haven't unveiled yet. We stand behind all of it. If you sign-up, try it out, and decide this isn't for you, just email us at support@theweddingschool.net and we'll issue you a full refund. Easy. Seriously, click to check out the full list. It's a remarkable collection.